The new SQ-500 Full Spectrum quantum sensor and MQ-500 Meter feature an improved detector that provides excellent measurements under all light sources, including LEDs, right out of the box. 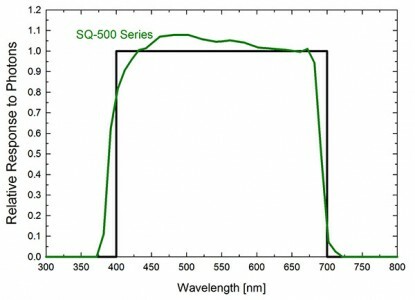 The improved spectral response of the SQ-500 increases the accuracy of LED measurements making it ideal for use with both natural and electric light sources. This cosine-corrected sensor is designed to maintain its accuracy when radiation comes from low zeith angles. The sensors measure PPFD with a cosine response accurate within ± 5 % at 75 ° zenith angle. Head is potted-solid making it submerisble and suitable for use in all climate conditions. To ensure accuracy each sensor iscarefully calibrated in controlled conditions and traceable to NIST reference standards.